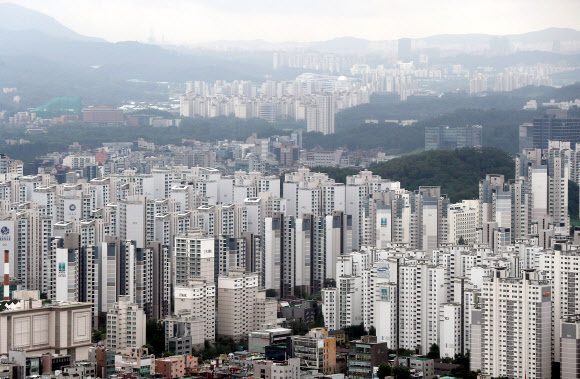 More than five out of 10 South Koreans are supportive of the government's plan to hike real estate tax rates to curb rising housing prices, a poll showed Thursday. In the survey on 500 adults conducted by Realmeter, 56.4 percent of the respondents said that they are in favor of the government's plan to strengthen the so-called comprehensive real estate tax scheme. It showed that 30.7 percent oppose the move. Later in the day, the government plans to unveil stronger measures to cool down the overheated housing market. It seeks to raise the comprehensive real estate tax rates for the owners of multiple houses or expensive homes. Amid ample liquidity, housing prices have spiked in recent weeks, prompting the government to pledge efforts to curb speculative demand.